As I sat in an emergency room for four hours last night (turns out I’m not pregnant; they just switched the urine samples), monitoring the draft status on my phone, two thoughts ran through my mind: would the Rams rue picking Bradford, and why didn’t I realize how many hot nurses there are in hospitals? Seeing as how pretty much everyone expected the Rams to take Bradford, I won’t discuss the pick that much. I personally have mixed feelings about the call, but if the Rams see some intangible in him that they had to have, I applaud their commitment. Let’s see if it works out. Bradford obviously has the physical tools, and the Rams can use the rest of the draft to upgrade various positions, including the offensive line, if need be. Perhaps the last time you'll see Bradford on his feet for a while. Still, there were some pretty notable draft picks in the first round. I’ll highlight a few of them that stuck out for me. Not that I think it’s a bad pick. McClain was the best player on the undefeated Alabama team last year. He’s an absolute beast who will help a terrible run defense. But Al Davis has a history of making inexplicable first round picks (Darrius Heyward-Bey? ), and I was sorta hoping he’d do the same this year. Again, not a bad pick. Spiller was generally considered the best halfback in the class, and Marshawn Lynch was going nowhere in Buffalo. But a lot of people figured the Bills would take a quarterback or offensive lineman with this pick. Thomas is a top-tier talent. The only reason I’m mentioning this is because of Pete Carroll, the newly-installed coach of the Seahawks, who picked Thomas over Taylor Mays, a safety from USC, his former school, who is an absolutely freakish athlete. There were questions about Mays’ intangibles, but still…that’s gotta hurt. I just wanted to highlight the Missouri defensive captain. Weatherspoon was an absolute beast during his time at Missouri, and it’s good to see him get his dues. Congratulations, Sean. Other than Jimmy Clausen, this was perhaps the most shocking fall in the draft thus far. Coming into this year, Dez was a top-10 lock. His subsequent suspension and “character issues” likely cost him $10-15 million. Keep an eye on Dallas the next couple years; this might end up being the best bargain of the 2010 draft. How many of you put Tebow ahead of Clausen? Yeah, right. This was easily the most talked-about pick of the night. Like Steve Spagnuolo and Sam Bradford, Josh McDaniels’ future in Denver will forever be connected to Tebow and his progress. Fortunately for McDaniels, he at least has a serviceable starter right now in Kyle Orton, so Tebow will most likely sit a year or two. 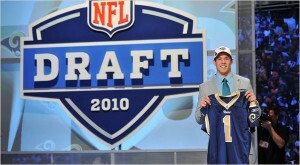 Well the Rams are now back on the clock with the first pick of the second round. Most likely (and hopefully), the Rams are gonna do their best to trade this pick away in exchange for two or three additional picks. For me, the most important upgrades have to come on offense. After being absolutely spoiled with Holt/Bruce for the better part of a decade, the Rams are without a top-flight wide receiver. I’d love to see the Rams get either Golden Tate (Notre Dame), Damian Williams (USC), or Arrelious Benn (Illinois) as a go-to receiver. Benn might be the receiver with the most potential upside, but health remains a question for him. Williams is solid and very quick, but not especially fast. Tate is smaller than those two, but he has incredible hands and a terrific vertical. I truly don’t think the defense is as bad as people perceive it to be. Chris Long, James Laurinaitis, and Bradley Fletcher are all showing promise as being reliable foundations for a young defense. If the offense can prevent so many three and outs and get the defense some rest, expect to see the defensive numbers improve significantly.